When Rosalind Llewellyn had to join forces with her enemy, Christopher Ellis to defeat a rogue Vampire threatening Henry VIII, their alliance led to a surprising passion. Reunited after a years separation, they face a new threat that could destroy their last chance at happiness. Somewhere in his mind, fear lingered. She might desert him like a malicious fey from a fairy story, leave him forever bereft and unable to exist without her. He returned to the bed and grasped one of her wrists. "Must I tie you to the bed, my lady, so that I can take my pleasure without fear of being stabbed, or bitten, or scratched?" I was very excited to pick up the second book in this series. 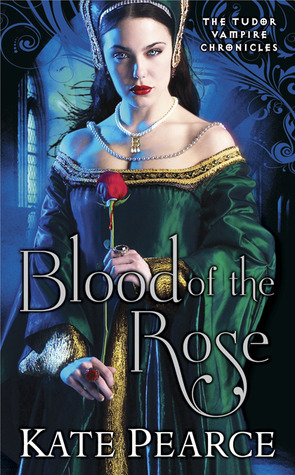 Blood Of The Rose is full of romance, suspense and Tudor scandal. Kate Pearce does a good job of mixing historical fiction with paranormal romance. The story picks up a year later with the Druids continuing to protect King Henry VIII from the threat of vampires. Rosalind and Rhys have returned to court. Once again they must call a truce with enemies Christopher and Elias in order to keep the infamous Anne Boleyn from turning the king into a vampire and taking over England. The first book left Rosalind and Christopher’s relationship up in the air. I was happy that their romance continued despite the dangers of being on opposite sides. The harder they tried to stay away from each other, the more their feelings seemed to pull them together. The relationship remained rocky thorough the story, but I was very pleased with the way the ending was handled. The introduction of the Boleyn family kept me in suspense. From history, I knew what would happen, but I was anxious to see how the story would twist to include them. Anne was always thought to be very ambitious and into dark magic, so making her a vampire was a stroke of genius. I love this series and can’t wait to see what happens in the next book. Four flowers of love. I really liked this book and would recommend reading the series. Thank you for the review. This book has caught my eye and has been added to my tbr list. You should definitely check this series out. I've been wanting to get to this one so I was happy to see you reviewed it.